Virtually every action you see the Dem's in Congress take, along with their Media cohorts, is all about their "Resistance" plot to slow down, stop or impeach the President at every corner and it began the day he won the 2016 Presidential election and hasn't stopped since. Record levels of unemployment in America, including for minority Americans, that make up some 75% of the Democrats constituency. The dismantling of job-killing regulations. The replacement of NAFTA with other promising trade agreements on the horizon including the European Union and China. All these as well as countless other achievements show this President to be one of the, if not THE, most successful President in modern political history. The Dem's and the Socialist loving media have been working hard to NOT allow these facts to get out, so allowing the President to speak directly to the People of our nation makes this their worse nightmare as it will have to get airtime on all platforms and millions of American's will hear it. By the way, this is why they hate his tweeting so much, he goes right around the fake news. And should the partial government shut-down (because the Dem's and their donors who have voted for barriers before MUST resist Trump on every front, every time) still be going on....this too is a Democrat nightmare scenario. Of course Pelosi wants to shut this down. This new Democrat Progressive Party always try and shut down free speech of the opposition at any cost because the greatest threat to their agenda is for the truth to be exposed. Something tells me though, Trump will have none of it and the show will go on. -W.E. Likely mindful of the optics of President Trump criticizing Democrats for refusing to fund border security, House Speaker Nancy Pelosi Wednesday urged Trump him to delay his State of Union address. Or just print up the speech and send it over to Congress. Fox News called Pelosi’s request “extraordinary,” with Trump scheduled to deliver the annual address to a joint session of Congress on Jan. 29. Even if Pelosi would formally withdraw the invitation, Trump would have other options, such as delivering it from the Oval Office or arranging an invitation from Senate Majority Leader Mitch McConnell. Pelosi said the delay was necessary because of the partial shutdown of the government and “security” concerns. She pointed out that the Secret Service and Department of Homeland Security haven’t been funded for 26 days – leaving out that House Democrats have refused to approve a bill acceptable to the Senate. She said the “full resources” of the federal government are needed to assure the security of the event, where Congress, the president, vice president, Supreme Court members and others would be present. The address has been delivered in person in recent decades, but that has not always been so. And commentator Philip Klein at the Washington Examiner suggested that a written address might be the better choice at this point. 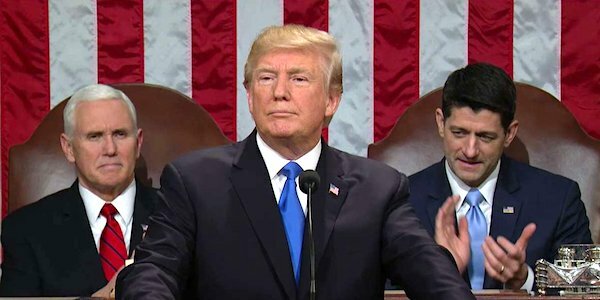 “The State of the Union as a television event may have served a purpose in the past, when the ability of Americans to see or hear the president and understand his priorities was somewhat limited. Also, in the past, when there were issues on which the parties could work together, there may have been some justification for the president making the case for his agenda to the whole Congress,” he explained. But he said a written address, or maybe some social media statements, would do the job now. President Trump has cited both national security and humanitarian crises at the southern border in asking for $5.7 billion for border security, including barriers. Democrats not only flat out refused to include border security funding, they refused even to negotiate or discuss it. Pelosi claimed that Trump was “petulant,” and Sen. Chuck Schumer claimed the president had a “temper tantrump,” a statement refuted by other people who were there. This week, every Democratic lawmaker invited to the White House to discuss the issue refused to show up. The president repeatedly has affirmed his willingness to negotiate and compromise on the issue.